Agape Boarding School equestrian (equine therapy) program. – therapeutic schools and boarding schools for girls. Agape Boarding School has a great horse program. This program is designed to utilize the God-given, natural therapy offered through the horse to promote personal growth in confidence, character, responsibility, and leadership skills. Many life lessons can be learned from the back of the horse. It is the intention of this program to teach young men to become good leaders of themselves, their homes, and their communities. The students are involved with all aspects of the farm, from feeding and veterinary work to assisting with foaling and calving. 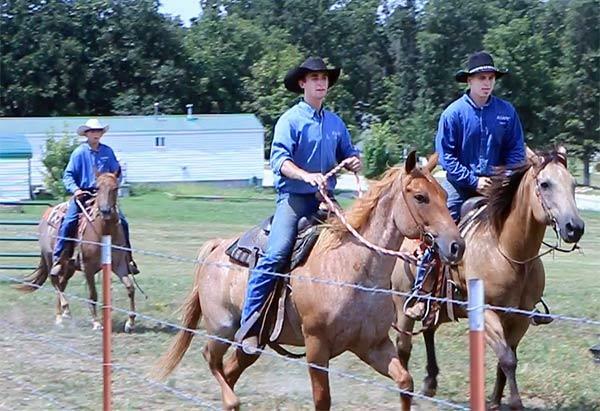 In the colt class, the boys start working with the young horses when they’re weaned at about 7 or 8 months old. They learn how to halter-break them and teach them to lead, walk over tarps and pick up their feet. The training process begins in earnest when the horses are about 2 years old. We take a long time training and start really slow, teaching the boys how to be around the horses and watching their responses before we ever saddle and ride them. Then, the boys start working their horses in the round pen. Eventually, we’ll go trail riding and gather cows on horseback. Every once in a while a boy may get bucked off, but it gives him an opportunity to learn how to dust himself off and get back on. As the young horses learn and grow, so do the young men. You can’t control anything until you can control yourself. That’s why most of these boys are here. They couldn’t control themselves. They got in trouble. And horses make great tools for rehabilitation. When they help a young colt get over issues like being saddled, crossing a creek and other things that spook it, the boys are learning how to conquer fear and overcome obstacles in their lives. Equine Safety — teaches basic knowledge of horses, cattle, and equipment. Tack and Care — teaches the basics of caring for a horse. These courses use the natural apprehensions, thrills, and victories, associated with entering a relationship with a horse to reopen a heart and mind that has been closed to leadership, learning and love. Our program is based on a personal working relationship between a young man and his own horse . Because of a horse’s instinct to survive and interact socially he is very sensitive to his environment and becomes a mirror of the young man’s emotions and feelings. Through exercises in natural horsemanship, each young man must learn to communicate on the horses level and develop a trusting relationship that allows him to lead the horse without force or coercion. Through this process, the teen boy learns more about himself and his personal relationships with others than he does about horsemanship. The program uses a genuine approach to working with horses that is free from gimmicks, games and props. This is just “the boy and his horse.” The main focus is the boy. The goals and accomplishments are not for the betterment of the horse. The horse will be used to better the boy. The curriculum also includes Biblical aids in an understanding of overcoming fear, controlling behavior, and becoming a man of integrity. *For students who desire to further their education within the equestrian program there an advanced class and a vocational class are offered. Both classes will only be available through parental and administrative consent. This class will go into much more detail and teach all the skills that one would need to work on a ranch including: training, performing, breeding, foaling, building tack and tack repair, farrier basics, and horses as a business. The following photos were graciously supplied by TODAY’S FARMER MAGAZINE, which had an article about the program in their June-July 2018 issue, and also produced the video at the top of this page. Agape Boarding School equestrian (equine therapy) program.